Multipurpose labels feature removable adhesive and neon colors. The labels adhere to smooth surfaces including paper, cardboard, plastic, glass and metal. 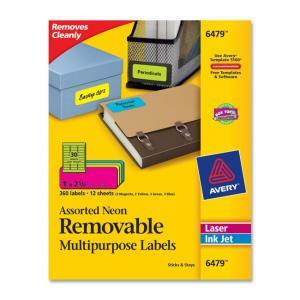 Rectangular labels stick and stay, but remove cleanly, leaving no residue behind. Vibrant colors on each label make your message stand out. Assorted neon colors include pink, green, yellow and blue. Multipurpose labels are compatible with laser and inkjet printers. Avery offers many easy-to-use templates for Microsoft Word and other popular software programs.